Raw Mango Chutney or Aam ki chutney is simply tongue tickling. The recipe is quite simple and easy. 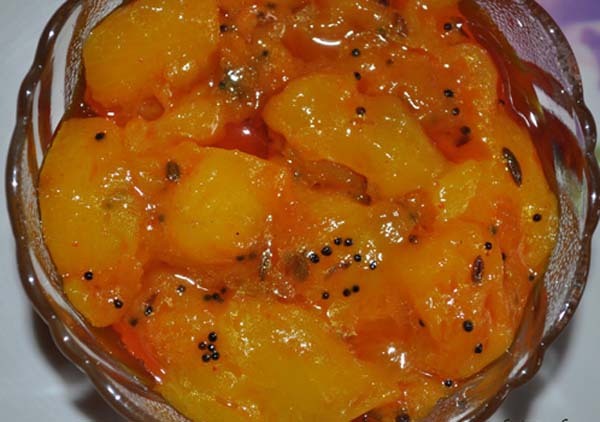 You can serve this delicious Aam ki chutney as condiment or use with bread like a jam. Remove skin of mango and cut into slices. Heat up oil in pan and cook raw mango in it on high flame. Remove seeds of green chilies and add in raw mango. Stir well. After 2 minutes add jaggery. when starts cooking add black seeds, mustard seeds, cumin seeds and salt. Cook till mango becomes soft. Keep in sterilized jar.